We Need A Little Spirit…WIAW!! How do you not feel in the spirit on the most fun day of the week…What I Ate Wednesday! Of course, by now you should all know that this fun is all under the direction of the ever lovely Jenn over at Peas & Crayons! You know that with Christmas coming up on the weekend, this week’s offerings are going to be unique. Either fabulous party food or on the run ideas. Either way…take a look, tell everyone how wonderful things are or how clever they are for thinking of that on the run. We love your comments, so quick…get over there and spread some around! I’ve been bemoaning my lack of Christmas spirit. It has come and gone and come back again. Brought back by a strange thing, but first…The Eats! I’m one of the on the run people. I am dazed and confused and have had No fun foodie events to attend yet. Mine will all come over the weekend and during the week next week. You better know you’ll need to check out my food goodies Next Wednesday! 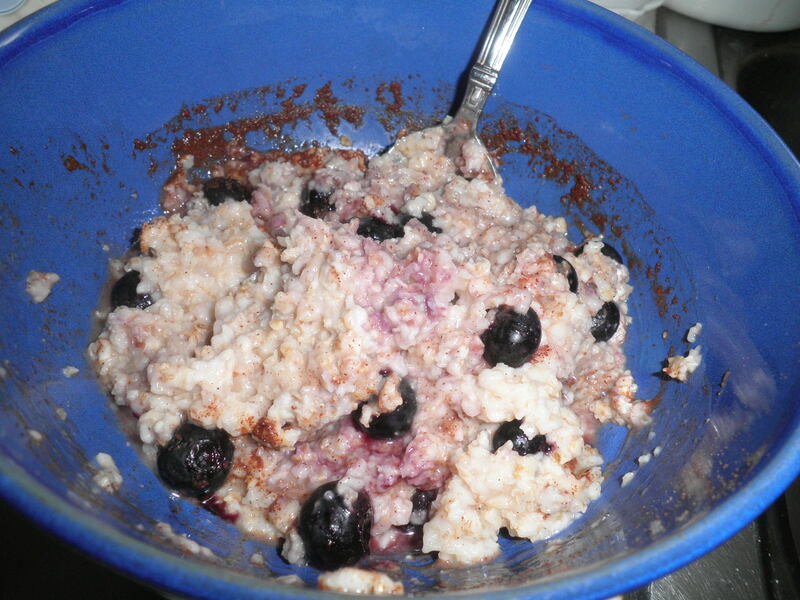 Oatmeal with cinnamon and home frozen blueberries. My Favorite! Added some almond milk and it was scrumptious! So good that I had a repeat performance of it this morning! My favorite quick “I’m starving and I don’t have time or energy or a Clue” lunch/snack. Gala apple with almond butter (fill in the nut butter.) So yummy! I’m so glad that the Gala apples I got at the produce market were good. Sometimes the apples there are not the best, but these were Great! Fixin’s for a wonderful salad in my Big Purple Bowl of course! 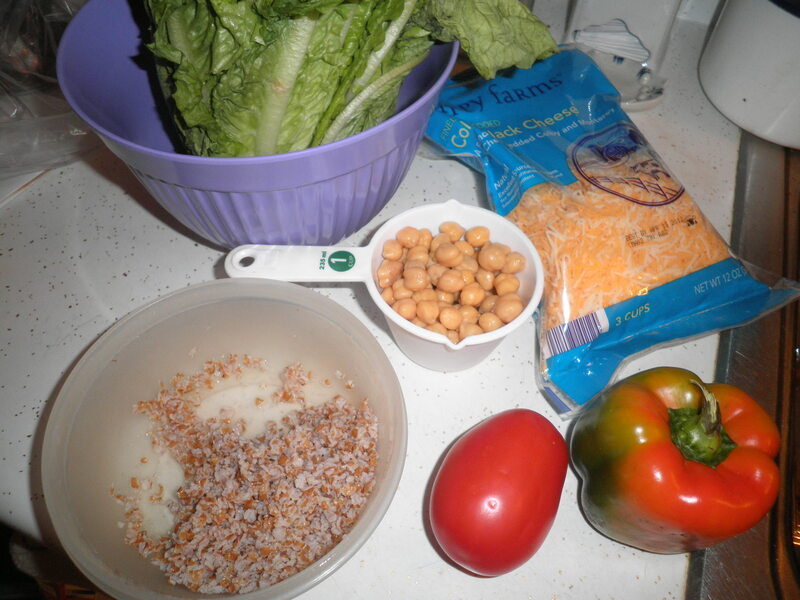 Romaine, tomato, bell pepper, garbanzo beans, bulgur (last of 😦 ) and shredded jack cheese combo. I’ve decided I’m going to try to stay away from bottled dressings and make my own. No mystery ingredients and it’s probably less expensive too. I combined 2 Tbsp of olive oil, 2 Tbsp of balsamic vinegar and 1 Tbsp of cranberry honey. I added a little ground black pepper and Wow was that delicious. 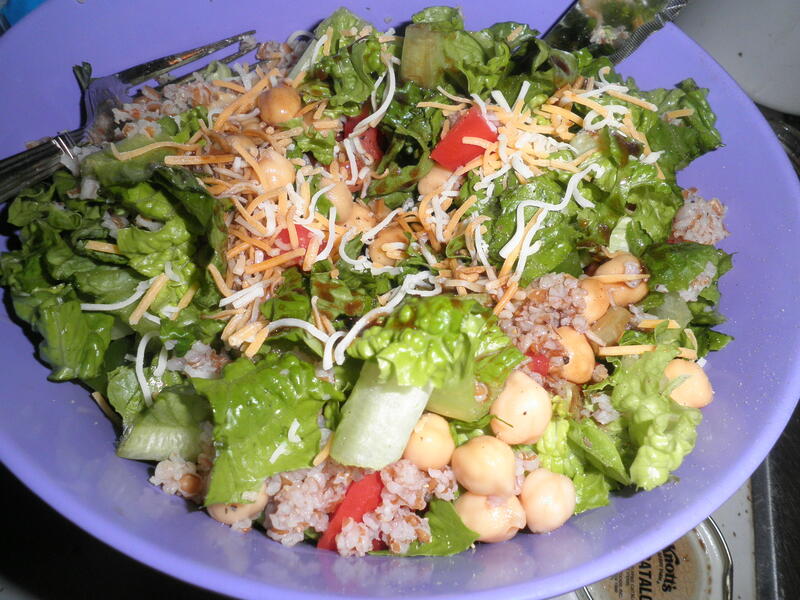 It made just enough for this big salad without leaving a lot of left over in the bottom of the bowl. I’m going to continue making my own. Some variations will be fun to figure out. Now on to what brought back my Christmas spirit. Sounds crazy, but shopping! I hate crowds especially this time of year. I had 2 stops to make…first Kohl’s where I was excited to find something that I wanted for a particular person that I had given up on finding (although Kohl’s is where I found it before.) That made me very happy. Yes…Barnes & Noble! I had to go there for gift cards. I decided that I was going to enjoy the visit. I got myself a sugar-free, fat-free latte which was made wrong but I enjoyed it never the less. Just strolling around the store made me feel better. I did some Nook Looking. I’ve been saving and may decide to get one. The young lady there explained a lot of things to me which really helped. I’m still thinking about it. I don’t know why, but it has turned my mood around. I think I can do this. I sound like Bill Murray at the end of “Scrooged.” That is a wonderful Christmas movie…if you’ve never seen it…Get It!! One last fun thing to share with you. My friend Stephanie from Love Life Project is a big Zombiefile. This is for you Steph!! Zombies 2012!! I love it. 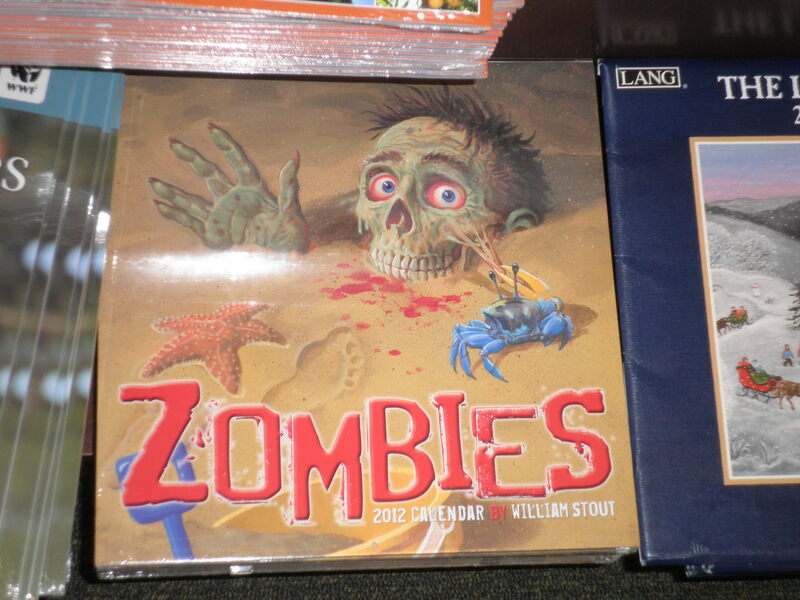 I really need to start thinking about getting into Zombies…it seems everyone else is! Maybe it will be my new thing for 2012! Anyway…remember to visit all of the festivities over at Peas & Crayons…You know you want to! Happy WIAW!!! Catch the Spirit!! This entry was posted in Uncategorized and tagged Big Purple Bowl, fruit, oatmeal, salads, WIAW. Bookmark the permalink. Ah, zombies. I’ve loved zombies ever since I was a kid. I remember my parents watching the classic Romero movies when I was little. I wasn’t allowed to watch them, but I snuck in and saw it anyway. I thought you’d enjoy that, Stephanie!! I’m going to try to like zombies in 2012!! What a delicious looking breakfast! Hi Alexandra…yes…B & N can be a dangerous place! Happy WIAW! I have no option but to get in the spirit, there’s an ice rink outside my office blasting Christmas songs! Laura, that would Definitely put you in the spirit! Oh I hate crowds too, it makes me anxious. But I love all your eats as usual. I’ve been making my own dressing forever and it is definitely so much cheaper. Cranberry honey? Sounds so yummy. Apples + nut butter are a no fail combo! I do think almond butter is my favorite though. I have one of those apple slicers too! But I like to slice my apple super thin, so I hardly ever use the slicer unless I’m in a rush! Hi Liz! I like the slicer because I’m Usually in a hurry! 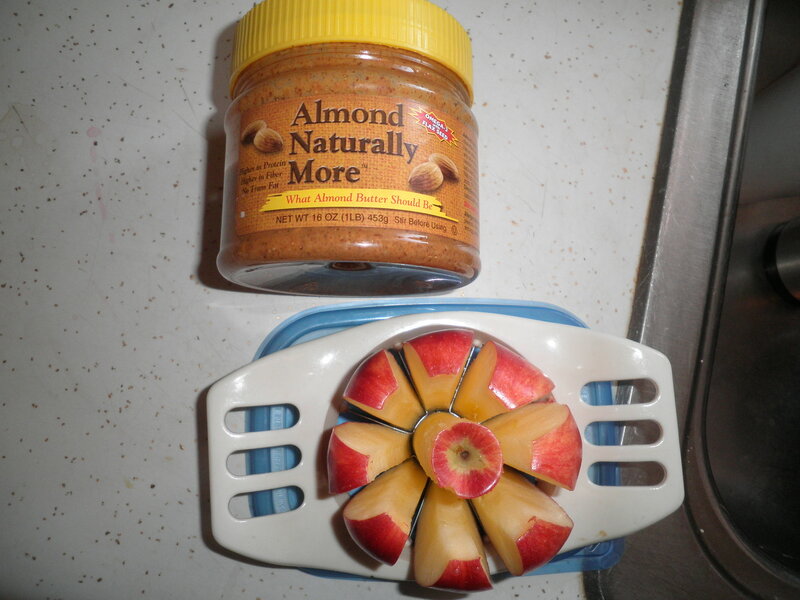 Love the apples and nut butter…yum! nothing beats Barnes and Nobles during the holidays. I love staying in there with some cocoa and reading! happy holidays fran! Thanks, Lindsay! Happy Holidays to you as well! Barnes & Noble is one of my happy places too! Okay, Borders was always a first choice, but it’s not an option any more. And there’s a huge used bookstore in town I love–but it doesn’t sell hot coffee treats, so pfft. Jealous that you found good apples! I keep buying a few here and there just in case, but they are definitely out of season right now in terms of quality/flavor/texture. And price. Barnes and Noble is my happy place too 🙂 I want to try the naturally more almond butter! I love the peanut butter, but I think the almond butter was more expensive for some reason. I think it’s still worth trying at least once! Hi Tara! Naturally More is the only almond butter I’ve tried. I think it’s good. I guess I need to go to Trader Joe’s to get a more reasonably priced one. Glad you like B & N too! I Love it!! Kohl’s can definitely be an amazing place. Glad it got you into the spirit. Scrooged is classic! Hey, Zo! Scrooged is Ralph’s favorite! We watch it every year…sometimes not even at Christmas! 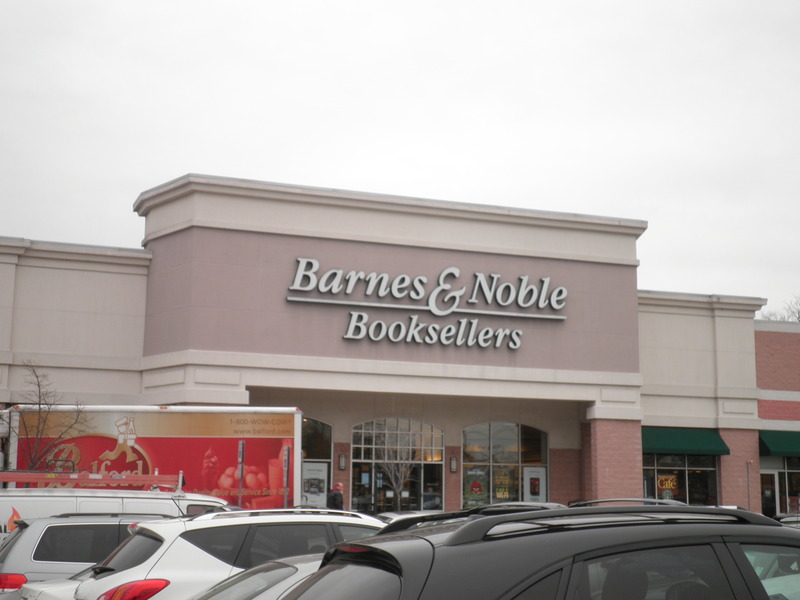 Tessa, sounds like with all of us who like B & N, we need to set up a meet up somewhere!!! Wish we could…I think we’re all too spread out, unfortunately! I could spend hours there. Sometimes if I’m having a bad day, I just go, browse around, don’t buy a thing, but I feel better. i want one of those apple cutter tools and it is on my christmas list, actually. hoping i get one! Hi Sara! I love my apple cutter. it makes it so easy! I got mine at K-Mart or something. Not expensive. Worth it though! Hi Faith! Thanks for visiting! It seems that everyone who’s commented today agrees with B & N being the happy place! Glad I’m not alone with this non-Christmasy mood. Love Scrooged!! I love the look of your salad – so fresh! Hey, Sarah! The wrapping always help with feeling in the spirit. I was working on it this afternoon and it has helped! I love my salads. Having one for dinner again… ooohhh…soon. Yum!